This Jerrybox LED lighted mirror is the ideal, at-home cosmetic makeup mirror and the perfect solution for your beauty needs! The adjustable LED illumination and 180° viewing angles make this mirror a premier beauty product! 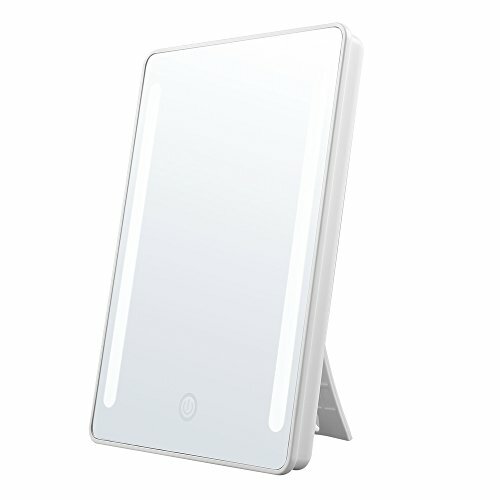 The Jerrybox mirror features a 180° rotation design to give you a perfect panoramic view of your face. Even more, you can adjust the side mirrors to any preferable viewing angle. Pluck your brows, tweeze, put on or adjust contacts, or touch up your lipstick anytime! This entry was posted in mirrors and tagged 180°Rotation, Adjustable, Back, Batteries, Charging, Dimmable, Foldable, Jerrybox, Lighted, Makeup, mirror, Natural, Stand, White.